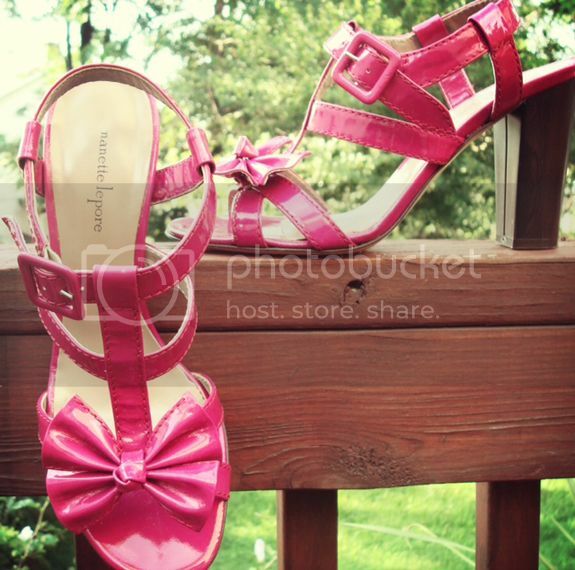 Known to be flirty and feminine, these designer Nanette Lepore Bad Girl Bow sandals with a patent leather finish in a bright fuschia (size 8 1/2) will add the perfect girlie touch to any look. Pair it with your pleated mini for an extra dainty flair. These sandals have been gently worn and are in great condition. With a stacked heel height of approximately 4 inches, it makes for perfect all day wear. Original box is included along with logo shoe bag. Retailed for $340. Sadly I'm letting these go to a fabulous new home for $18.